Call me old fashioned, but even in this digital age, I still believe that a high quality wedding album is the best way to really show off your wedding pictures and today, I’m delighted to be sharing one of the latest designs to leave the office. Martha & Stephen were married last July at St. Leonard’s Church in Dunfermline before heading over to my local venue, Glenbervie House, for their reception, and what a glorious day it was guys, blessed with some fabulous summer sunshine…oh yes, the old factor 30 was definitely in use that day! For their album, the guys chose one of Graphistudio’s “Young Books” with a whopping 68 pages. 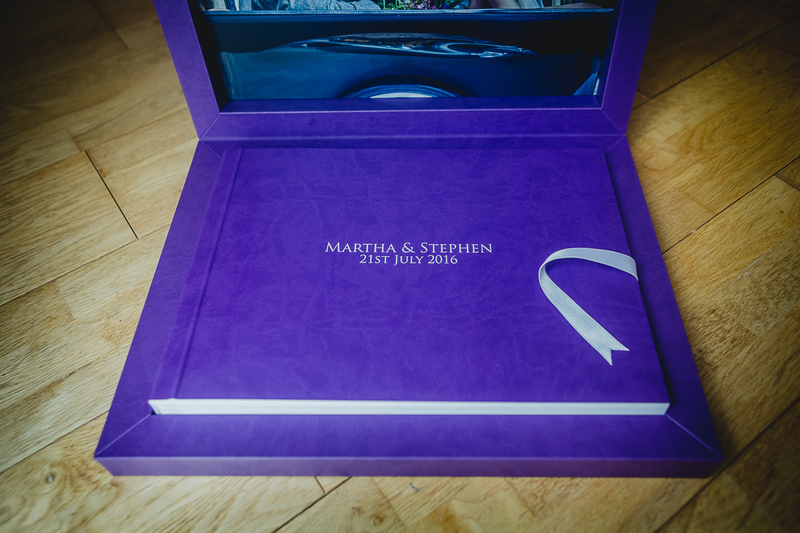 The “book in a box” concept of the Young Book allows for many different combinations of colours and materials and, for their album, the guys opted for a a purple cloud leather finish and took up the option of using one of their pictures on the inside cover of the box. Great to be sharing yet another album design with you today (yes, it’s been a busy time for our DHL delivery guy with all these albums coming and going), and, this one I’m particularly keen to share with you as it features one of the first time’s that I’ve used the lab’s new enoblement programme…but more of that later. 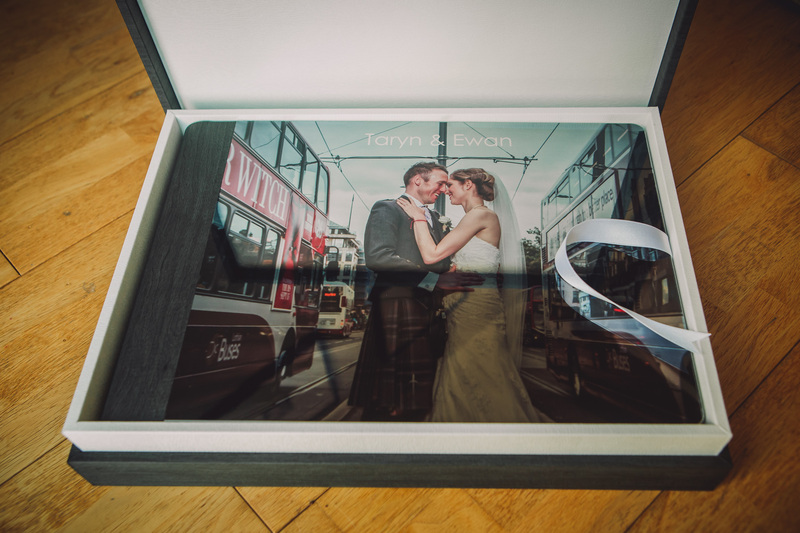 Siobhan and Eoin were married last August with the ceremony taking place at the impressive University of Glasgow chapel, followed by the short hop to one of my favourite venues, Oran Mor. 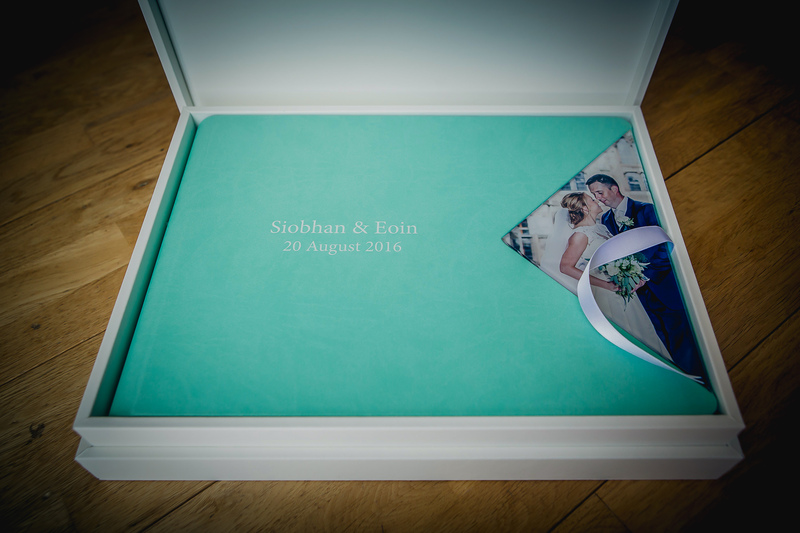 For their album, the guys opted for one of Graphistudio’s “Original Wedding Books” with 60 pages and opted for the greenish blue cloud leather cover with the die cut picture insert. For the design box, we took advantage of the aforementioned “enoblement” programme, and recreated the design used on the table names and other “bits & bobs”, that had all been created by Siobhan’s sister, Roisin. This all makes your album totally unique and carries on the theme and style of your wedding day :-)…how fabulous! Today, I’m delighted to be sharing a new album design with you guys featuring Jill & Johnathan’s wedding at The Cruin back in 2015. Although over a year ago now, that day still sticks in my mind as one of those classic “all weathers” Loch Lomond days…cloud, rain, sunshine & showers…yep, we had it all! 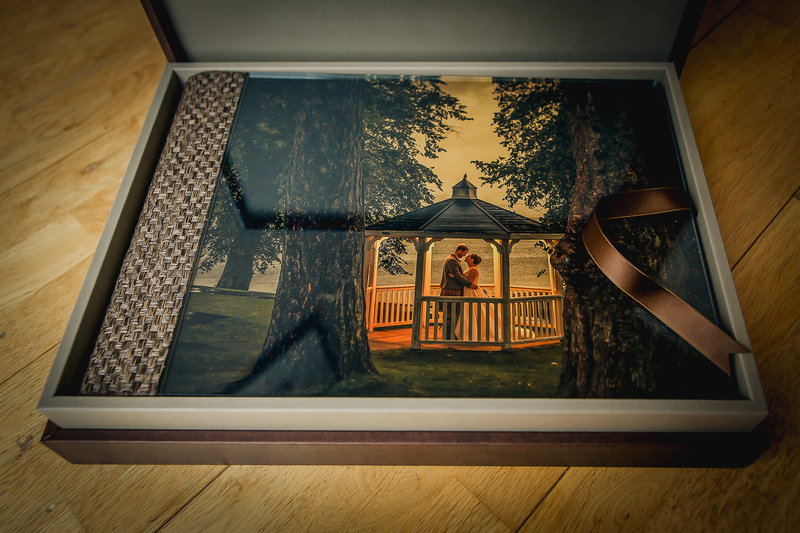 For their album, the guys chose one of Graphistudio’s “Original Wedding Books” with 60 pages and opted for the crystal glance finish for the cover, complete with the brown woven binding and a complimentary brown & brown/grey cloud leather design box to keep it all safe. All the pages of the album were then finished with the lab’s unique high definition printing. A lot of work goes into the designing and preparation of an album prior to it being sent off for printing. All in, I can easily spend around a day and a half with the selection of the images, the initial design, making any changes the couple want and then finally, what I call my “signature” editing process on all the pictures contained within the album to make them look their absolute best for printing. 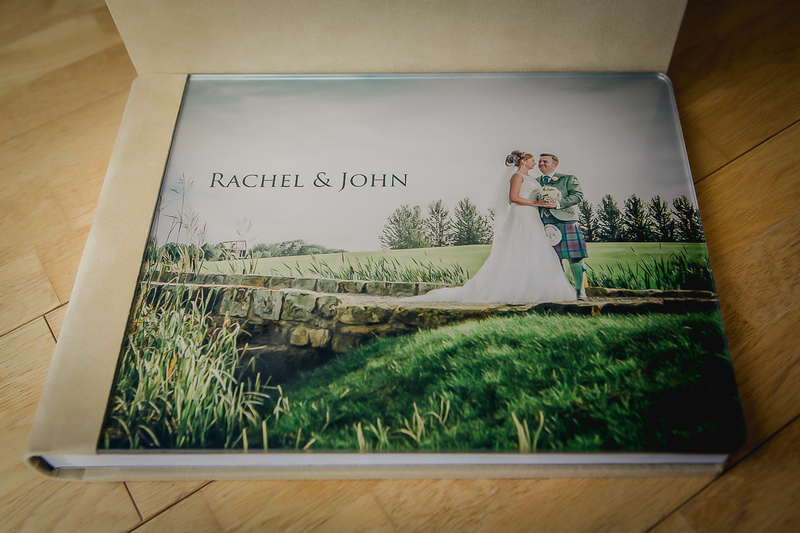 So, a couple of week’s back, it was great to catch up again briefly with Rachel & John as they stopped by the office to collect their wedding album. The guys were married at the Forrester Park resort last September and what a cracker of a day it was…scorching hot too (well, scorching for Scotland that is)…but, pretty warm all the same :-). For their album, the guys chose one of Graphistudio’s “Original Wedding Books” with 58 pages and opted for the crystal glance finish for the cover, complete with a sand coloured suede binding and a complimentary suede luxury sleeve to keep it all in. justify;”>For their album, the guys chose one of Graphistudio’s “Original Wedding Books” with 56 pages and opted for the very eye-catching silver metal polish finish for the cover, complete with anthracite grey binding and a complimentary design box to keep it all in – I’ve tried my best but it’s hard in an image to get across how fabulous this cover looks :-). So, a couple of week’s back, it was great to see Taryn & Ewan again as they stopped by the home office to pick up their wedding album. The guys were married last year with a legal ceremony on Seacliff Beach in East Lothian, followed up by the wedding day itself at the fabulous Ghillie Dhu in Edinburgh. For their album, the guys chose one of Graphistudio’s “Original Wedding Books” with 56 pages and opted for the very eye-catching silver metal polish finish for the cover, complete with anthracite grey binding and a complimentary design box to keep it all in – I’ve tried my best but it’s hard in an image to get across how fabulous this cover looks :-).